Standing behind much of the accommodationism in America is the John Templeton Foundation. This organization is loaded to the gunwales with cash, thanks to the investing activities of the late John Templeton, and it regularly uses its ample coffers to lure scientists into discussing “the big questions” in support of its aim to unify science and faith. (n.b. : whenever you hear the words “bigger questions” or “deeper questions” in this debate, rest assured that they really mean “unanswerable questions” or even “meaningless questions.” And you can also be sure that the answer to these big, deep questions involves religion.) Templeton likes having big-name scientists and secular academics on its panels and in its published discussions, for their presence lends an air of versimilitude to an otherwise bald and unconvincing enterprise. Dear Prof Dennett, I am a science journalist currently taking part in the Templeton Cambridge journalism fellowship programme in science and religion. As part of the programme each fellow takes an indepth look at one particular topic, and mine is “materialism”. In the first place I want to understand simply what is meant by the term (as it seems to have various forms) and then to understand how a materialistic viewpoint can or cannot be reconciled with the world around us (particularly as regards human nature).. For this I will be speaking to a number of different experts, including scientists, philosophers and theologians. Since you have written extensively on the philosophy of mind and related areas I thought that you would be a good person to talk to, and wondered whether you might be free at some point in the next three weeks to speak over the phone. I imagine the conversation would last around 20 to 30 minutes. If you would like to speak to me I would be grateful if you could tell me when would be a good time for me to call and what number I should use. I have had my say about materialism and the persistent attempt by religious spokespeople to muddy the waters by claiming, without a shred of support, that materialism (in the sense I have defended for my entire career) is any obstacle to meaning, or to an ethical life—see, e.g., BREAKING THE SPELL, pp302-307. I see no reason to go over that ground again, and I particularly don’t want to convey the impression, by participating in an interview with you, that this is, for me, a live issue. It is not. If you had said that you were studying the views of scientists, philosophers and, say, choreographers on this topic, I would at least be curious about what expertise choreographers could bring to it. If you had said scientists, philosophers, and astrologers, I would not even have replied to your invitation. The only reason I am replying is to let you know that I disapprove of the Templeton Foundation’s attempt to tie theologians to the coat tails of scientists and philosophers who actually do have expertise on this topic. Many years ago I made the mistake of participating, with some very good scientists, in a conference that pitted us against astrologers and other new age fakes. I learned to my dismay that even though we thoroughly dismantled the opposition, many in the audience ended up, paradoxically, with an increased esteem for astrologers! As one person explained to me “I figured that if you scientists were willing to work this hard to refute it, there must be something to it!” Isn’t it obvious to you that the Templeton Foundation is eager to create the very same response in its readers? Do you really feel comfortable being complicit with that project? directed at you personally, but I don't engage in Templeton-associated matters. Templeton's use of its great wealth to bribe compliance with this project. By the way, does anybody find these responses “uncivil”??? The John Templeton Foundation inaugurated the fellowship in 2006 to offer a small group of print, broadcast, or online journlists annually the opportunity to examine the dynamic and creative interface of science and religion. Creative interface only? What about those who want to write about the destructive interface? Thanks to Richard Dawkins, who secured permission to quote these emails, and who also has a commentary about Templeton on his website. There’s a new post at Pharyngula, too. This entry was written by whyevolutionistrue and posted on June 21, 2009 at 9:36 am and filed under Uncategorized with tags accommodationism, Anthony Grayling, Daniel Dennett, Edwin Cartlidge, John Templeton Foundation, Richard Dawkins. Bookmark the permalink. Follow any comments here with the RSS feed for this post. Both comments and trackbacks are currently closed. I didn’t get an invite. What the hell? Well, they are as “uncivil” as your book reviews… so yes, I imagine Chris Mooney finds them so. Of course they’re uncivil. There is no truth, only sincerity, and it’s completely uncivil to challenge anyone’s sincerely held belief. Oh wait… my tongue was kind of stuck in my cheek there for a moment. Bravo to Dennett and Grayling for eloquently and civilly declining and bravo to them and Coyne for continuing to expose the Templeton Foundation’s toxic motives. Dennett’s tone was a little haughty, but that probably stems more from frustration and fatigue than from incivility. Grayling’s reply was very polite and honest. I agree with both of them when it comes to Templeton–they are not a legitimate scientific or philosophical organization. They’re a glorified propaganda outlet. That, or he was wearing his pimp hat. 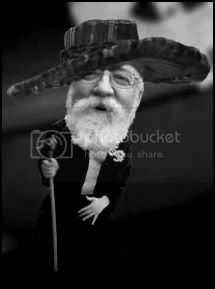 Don’t mess with Dennett: he is one with his body. Much to my chagrin, no! However, I did find it amusing that they both used “muddy the waters”…perhaps one may falsely construe from this, that uncleanliness is a common state of affairs over at the Dumbledore Foundation? Dennett’s and Grayling’s were the only appropriate responses to such a petition – kudos to them. They were not uncivil, although I would hazard a guess that Mr Dennet was having a rough day and I would hate to be a telemarker who calls his house. And I love the “choreographers” bit. I have learned a lot by reading you and Dr. Myers posts on the Templeton Foundation. I thought that the money the Templeton Foundation gave to science was a good thing, but your posts have helped me to clearly see how the Templeton Foundation really is threatening science with the way it uses its money. Keep up the good writing! Oh, if only Mr. Cartlidge would submit an essay for publication in a scientific journal – he’d quickly discover what ‘uncivil’ means. I love these two responses though; I certainly can’t imagine being so nice to Mr. Cartlidge while telling him he’s on a fool’s errand. From any rational point of view, there are entirely civil. However, they might be regarded as uncivil for people who think that astrology, voodoo or accommodation is viable. I mean, comparing the deeply felt emotions and practices of sacred astrology that rejects science with the scientific, experimental practices of astronomy must be very offensive to astrologers. Of course, they are not justified in feeling offended, quite the opposite in fact. Do note the direct attacks on atheism by Andrew Brown and Madeleine Bunting, as well as the approving profile of Terry Eagleton’s attack on atheism? Where are the direct attacks on faith? Is it just coincidence that the fellows always produce articles that are either laudatory about religion or at least very least very respectful of it — results that directly meet Templeton’s aims? I think not. People like Bunting and Brown are not only well known accommodationists (whose prospectuses for fellowship are surely screened), but hardly the serious journalists whose careers are supposed to be supported by Templeton. Templeton and Cambridge should be ashamed of themselves — bribing journalists with lucrative stipends to produce “faith-and-science-are-loving-PARTNERS” articles. It’s unlikely that Flanagan’s view will ever prevail at Templeton, but at least they gave him free rein to reach conclusions at odds with their bias. I imagine there are others funded by Templeton who have likewise reached what the directors likely feel is the wrong answer to the Big Questions, e.g., Does evolution explain human nature? outlooks,” it could be that their attempts to conflate science and religion will inadvertently help to naturalize religion. Not exactly what theologians committed to “assertive theism” have in mind. I think that says a lot about these types of people. Their logical faculties are abviously not up to par with the scientific community. I’m not sure what can be done to remedy this; their education was apparently lacking. A.C. Grayling and Daniel Dennett have refused to talk to a serious journalist (Edwin Cartlidge of Physics World) about a serious subject (philosophical materialism) because the journalism fellowship under which he is pursuing this subject is sponsored by the Templeton Foundation. They will have nothing to do with the Templeton Foundation, they say, because our aim is somehow to “muddy the waters” about the relationship between science and religion. That’s not how we see it at all. First-rate, peer-reviewed science is essential to our work at the Foundation and to the progressive vision of the late Sir John Templeton, who was deeply committed to scientific discovery. Many of our largest grants go to pure scientific research (like our support for the Foundational Questions Institute in Physics and Cosmology, the Godel Centenary Research Prize Fellowships, and the Program for Evolutionary Dynamics at Harvard). But, yes, we do like to include philosophers and theologians in many of our projects. Excellent science is crucial to what we do, but it is not all that we do. We are a “Big Questions” foundation, not a science foundation, and we believe that the world’s philosophical and religious traditions have much to contribute to understanding human experience and our place in the universe. For Grayling and Dennett to compare this rich, expansive discussion to a dialogue with astrologers is silly. They know better. The people at Templeton just don’t get it. It doesn’t matter how much money they pour into “peer-reviewed” science. As long as their organization also pours lots of other money into silly promotions of religion (i.e., underwriting the careers of Madeline Bunting and Andrew Brown), giving prizes to religious travesties like the movie Passion of the Christ, and so on, it will never be acceptable to atheistic scientists. The organization fails to realize that Templeton has tainted its “good science” endeavors with a bunch of worthless “let’s-cozy-up-to-the-faithful” endeavors. One hand dirties the other. And no, there isn’t a lot of substantive difference between religion and astrology, save that many more people adhere to the former mythology. I don’t think any respectable scientist should want to be a part of the denigration of science and the elevation of magical thinking in it’s place. At least not a scientist who values the truth. how is religion different from astrology and the other types of magical thinking that the Templeton Foundation find silly? Why would you consult “theologians” over, say, Scientologists to answer big questions? For Grayling and Dennett to compare this rich, expansive discussion to a dialogue with astrologers is silly. How or why is this silly, precisely? It’s silly because astrology cannot be supported by scientific evidence and religion…. “Science can’t explain it, therefore my woo is true.” This fallacious argument is used by many people to convince themselves that their irrational notions are “rational”. Is it any wonder that honest scientists want no part of this ignorance-promoting meme? Your response is silly. The charge was that the Templeton Foundation muddies the water. Your response is that you support peer-reviewed science. But there’s nothing incompatible with doing both, and that’s obvious, because that’s what the Templeton Foundation does. Until you respond to the specific charge that you illicitly include god-botherers in discussions and projects where there is no rational basis for their inclusion, because their brand of superstition is inimical to rational inquiry, you cannot dismiss Grayling and Dennett. A few centuries ago, astrologers had a rich, expansive dialogue going, too. Turns out they were wrong. The richness and expansiveness of their speculations can’t change that. By condescendingly attacking Grayling’s and Dennett’s comparisons as being “silly” – without even attempting to rebut – and then saying that “they know better” as if they are children and you have a right to correct them, simply makes you look like a douchebag. Not only were they being completely civil, but they passed up a good opportunity to remind the science writer that journalists have as great of responsibility to skepticism and objectivity as a scientist–maybe even more so. I think Mr. Cartlidge needs to take a moment to consider the repercussions and consequences of this fellowship program. What exactly do you ‘believe’ that the world’s religious traditions have to contribute to understanding human experience and our place in the universe? Can you specify one theory or explanation or bit of evidence that a religion has contributed to understanding human experience and our place in the universe? Perhaps, maybe, would it be better if you DID take the Templeton’s invites up, made sure you turned up well-prepared and in numbers, and publicly trashed the whole nonsense. “We’re scientists, our work, and the whole of modern civilisiation for that matter, rests on the understanding that events have physical causes, and that real things are detectable, even if not presently understandable. You are making the extraordinary claim that something called “god” may exist. Science is simply incapable of answering questions about the purpose or meaning or flavor of life (chocolate or vanilla, gelato or sorbetto) or identifying the key of life (despite Beethoven, probably not E-flat) or nearly any such question. It’s actually a feature. Dennett, Grayling and Coyne, I say bravo – you’re in good company. Oh look, no answer to my question, what a surprise. Really – it was a serious question. I would like to know. Rosen said ‘we [meaning Templeton] believe that the world’s philosophical and religious traditions have much to contribute to understanding human experience and our place in the universe.’ I would like to know what the world’s religious traditions have to contribute to understanding human experience and our place in the universe. It’s interesting to note how carefully phrased that is. Understanding human experience can mean almost anything, and the world’s religious traditions are not the same thing as a particular religion and its particular truth claims. It’s a cautious anodyne bit of PR fluff – which is a strong hint that it doesn’t actually mean anything at all. Accepting money from the Templeton Foundation must be a lot like peeing in your pants. A warm and comfy feeling at first. But after a while it really starts to stink. What I’d like to suggest is that the atheist scientist, in his outrage at religion and refusal to engage with it directly, might well be walking into what I would term “The Obama Trap.” In other words, by fighting Templeton the atheist scientist is getting “Obama’d” by Templeton, making the atheist scientist appear unreasonable and closed off to dialogue. I mean, think about the letter that the person sent Dennett and Grayling. It was as if it was written by Barack Obama. And the responses sounded like hard-nosed GOPers. …and here is santi, once again, with his nastiness and outrageous baloney. Santi has no grasp on reality, as shown by his previous posts. He makes up terms and randomly attributes actions to people that is never even close to correct. One of the troubles with this position is that anyone can take it. An astrologer or creationist or theist can say “I am right and you are wrong so there is no need for me to debate you. Debating you will only legitimate you.” In a debate via letters to a newspaper, I several times had Christians tell me that the BIBLE and Christianity needed no defense. Another trouble with this position is that the only way you can know that you are in fact right is to evaluate the arguments for an against your position. And as John Stuart Mill pointed out in ON LIBERTY, the way to come nearest to being sure that you are evaluating the strongest arguments for the other side is to hear it defended by a sincere adherent of that other side. The members of the audience who became more convinced of astrology because “scientists were taking so much trouble to refute it” were committing a falacy. Other than the two reasons cited above, there are many reasons why you might “take so much trouble to refute it” other than “it” being true. One reason is being concerned of the demage done if many people believe in astrology or religion. As a Gay activist, I wrote a response to a pamphlet, “Are Gay rights right?” put out by the Berean League, a homophobic Christian organization. The Berean League argued that the response of Gays proved they must be right. Instead of incurring the danger of people deciding they are no better than those Christians who said the BIBLE and Christianity need no defense, they should have pointed out the logical error committed by those members of the audience who concluded astrology must be true because they were “taking so much trouble to refute it” and continued to engage in vigorous debate with both astrology and the Templeton Foundation. Jerry – I think we have something to be embarrassed about, you as a faculty member and me as an alumnus. I think Dennett’s haughtiness is justified in that he is aware of the ad hominem attacks religion makes on materialism. He’s been there and he’s dealt with the annoyingly obtuse “questions”. As for the compatibility of science and religion, I agree with Dennett. I think we should explain religion scientifically. Objections to such explanations become objections to the methodological principles. I have the same opinion of the idea of ‘consciousness’. Explain scientifically why people believe in the free or unconditioned self, and objections become objections to the methodological principles (neurobiology, psychology, empiricism). At that point, if it ever exists, the debate is better defined and more constructive. Instead of debating “qualia” and “premonitions”, perhaps the debate would be about how best to study the mind, information, society. In my web site http://www.cicatrices.com.mx in the article “Response to ‘The angry Evolucionist'” (Richard Dawkins) I explain my new Theory of Evolution in which you do not need to be a Believer to believe it and you can believe it if you are a Believer. Close to the end i make a set of questions, try to answer them with and without my theory. This theory would be ideal for the states of the USA in which they have problems to decide what to teach in their schools. Please Read the article of Richard Dawkins and my response to him in 3 parts (I could not put it all in only one article).